GENERON IGS has completed and shipped a Ballast Gas Unit, as contracted by CB&I. This package will be installed in Lake Charles, Louisiana, USA. The plant is part of a larger Ethane Cracker facility constructed for Lotte chemicals and Axiall Corp. 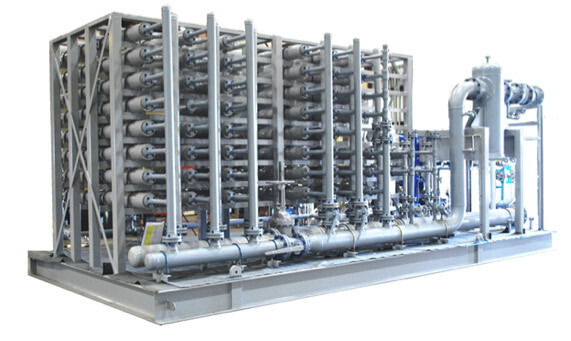 The system uses GENERON® membranes to purify an MEG Unit Ballast Gas Methane Stream. The feed gas to the Ballast Gas Unit is a raw hydrogen off-gas stream from the Ethylene Unit. A hydrogen-rich co-product is also produced which is returned to the plant fuel gas system. The system is designed to produce 800 kg/hr of ballast gas with a 50% turn-down and with a product delivery pressure of 124 psig. The entire package was designed by GENERON IGS to meet stringent customer specifications and is certified to Class I Division 2 and Hazardous Area classification for Gas Group B, C & D.
In addition to the GENERON IGS components, Houston Vessel Manufacturing, an affiliated IGS company, designed, manufactured, and supplied the Carbon filter and membrane vessels per ASME code.